Every home cook needs a soup like this in their arsenal. 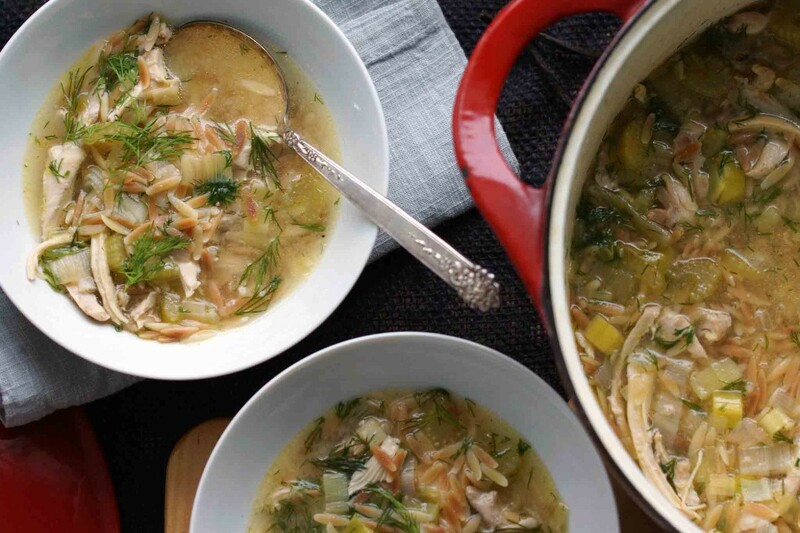 It’s the perfect thing to whip up when you feel a cold coming on, when the weather is frigid, or you’ve just got the blues and need to sit on the couch and slurp up some comfort. 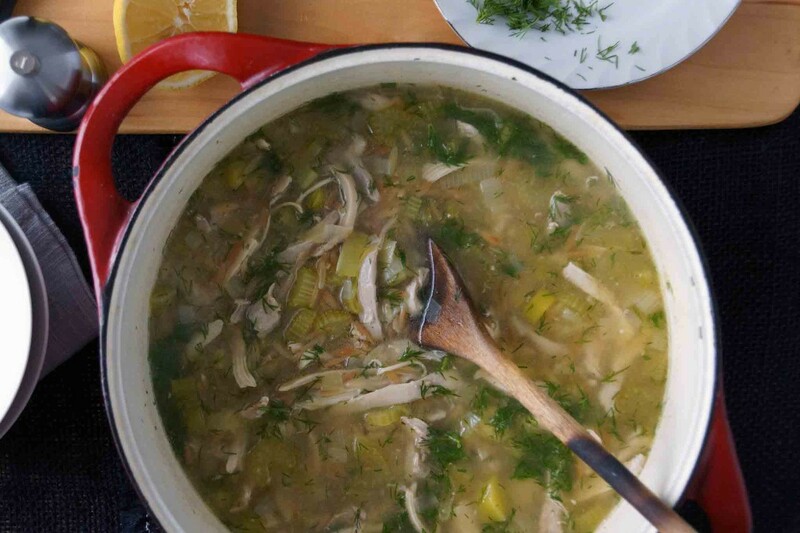 This is a chicken and orzo soup that’s loaded with fresh dill and bursting with bright lemon flavor. It’ll cure what ails you without weighing you down and without taking all day to make. I first spotted the recipe on shutterbean last winter and thought it looked like a perfect light, fresh take on chicken noodle soup. I made it right away and several times since and it always comes through for me. I’ll show you what it’s all about and maybe it will become your secret weapon chicken soup, too. Get your ingredients together and let’s get cooking. 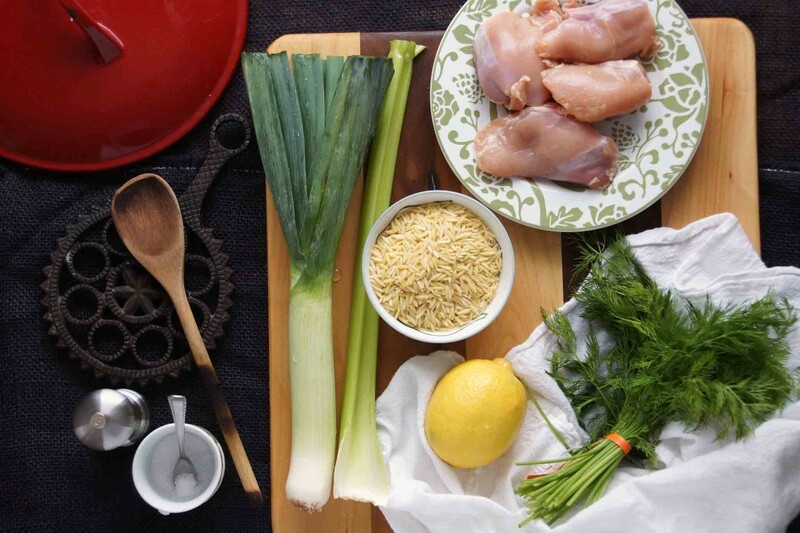 You’ll need some orzo pasta, a few chicken thighs, a leek, a stalk of celery, chicken stock, a lemon, and a handful of fresh dill. I like to toast my orzo to add an extra dimension to the soup. Just toss the pasta into your (dry) soup pot while you prep your veggies. In a few minutes it will smell nutty and will have turned golden. Dump the orzo out of the pot for now and start making the soup. 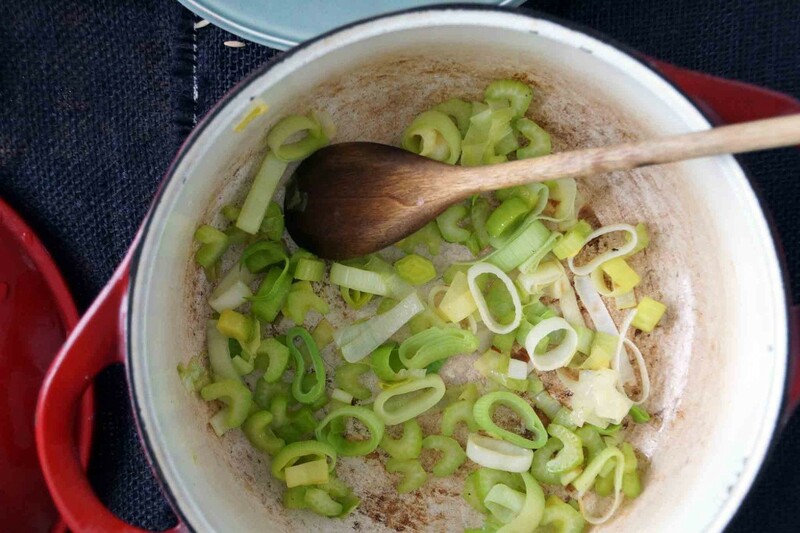 Sauté the leeks and celery in a bit of olive oil until they start to soften. Now add chicken stock and the chicken legs to the pot. Simmer until the meat has cooked through. Pull the chicken out of the pot and put the orzo in. While the pasta cooks, shred the chicken using your fingers or tongs and a fork. 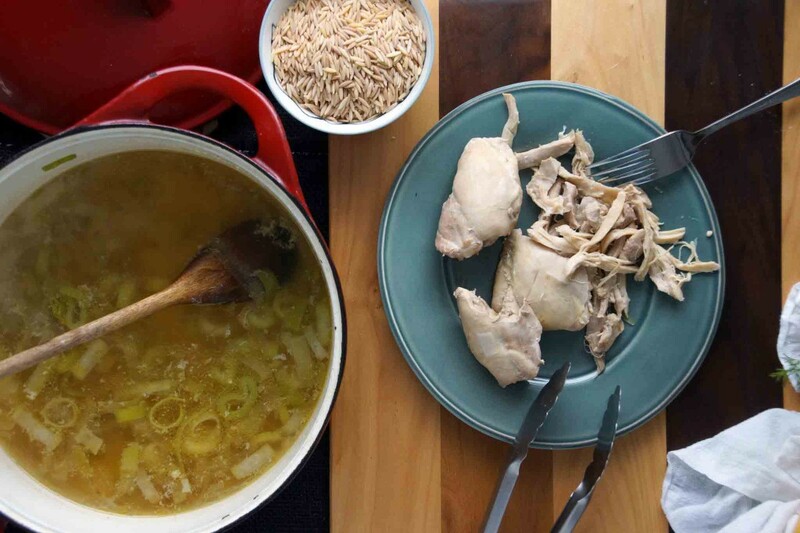 When the orzo is al dente, add the chicken back into the soup. Kill the heat, stir in a heap of chopped dill, plenty of black pepper, and a few squirts of fresh lemon juice. Ladle up a hot, steamy bowl of soup. Inhale…ah, just what you needed, right? 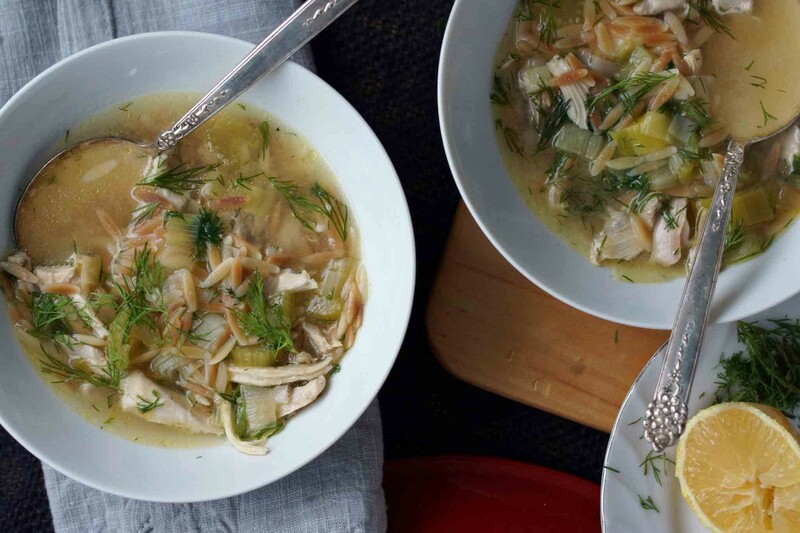 This light, bright chicken soup is a sure cure-all. 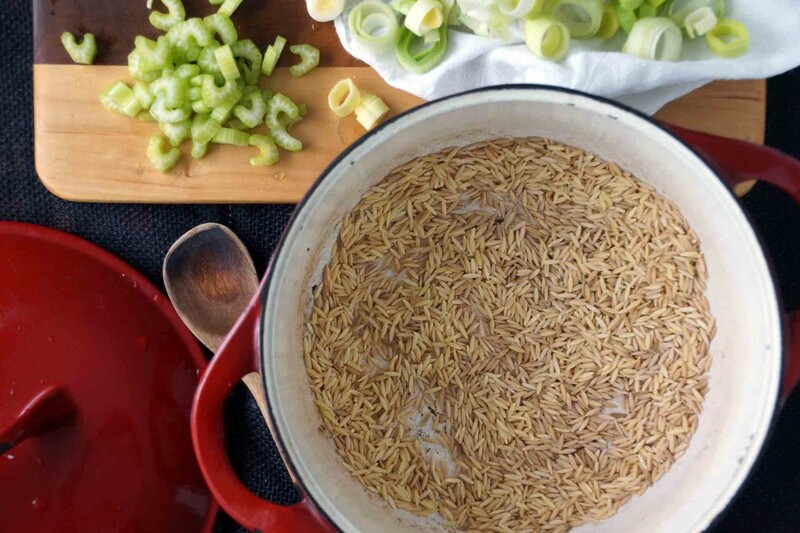 Spread the orzo over the bottom of a large, heavy soup pot or Dutch oven. Place over medium-high heat and toast the pasta until golden and fragrant, about 5 minutes, stirring periodically. Transfer to a bowl and set aside. Now add about 2 Tbsp. olive oil to the soup pot and place over medium-high heat. Add the leeks and celery, season lightly with salt, and sauté until they begin to soften, about 5 minutes. 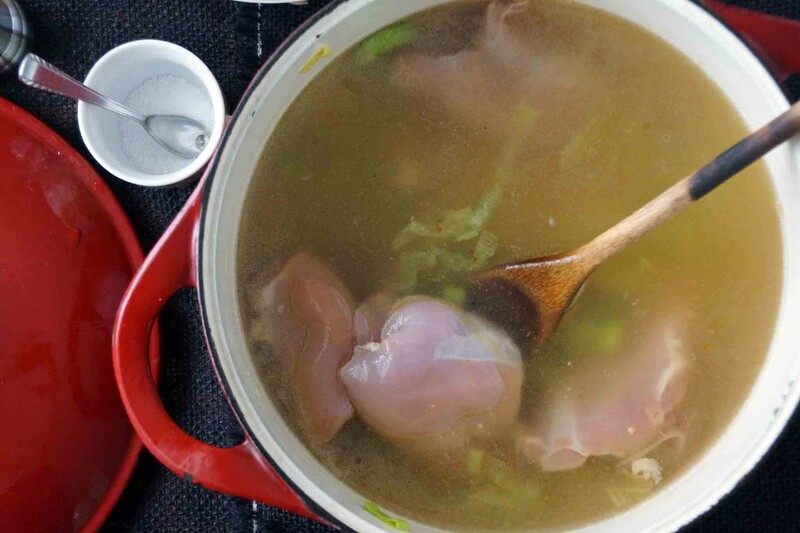 Add the chicken stock and chicken thighs to the pot and bring to a boil. I used barely seasoned homemade chicken stock, so I added a few pinches of salt at this point. Reduce the heat to maintain a simmer, cover. Simmer until the chicken is cooked through, about 15 minutes. When the chicken is cooked through, pull it out of the pot. Bring the liquid back up to a boil and add the toasted orzo. Boil until the pasta is al dente, about 8 minutes. Meanwhile, shred the chicken into bite-sized strips. When the pasta has finished cooking, add the chicken back into the soup. Remove from heat. Taste. Season as needed with salt and freshly ground pepper, then stir in the dill and a bit of fresh lemon juice. I add just enough lemon juice to brighten the flavors and serve additional lemon wedges alongside so everyone can get just the citrus zing they're looking for. French Onion Soup (Soupe à l’Oignon Gratinée): I made a batch of beef stock last week and will be making this very soon! Spring Vegetable Soup with Poached Eggs: I can’t wait ’til spring when I’ll be able to make this again! Glad you’re here to stay! 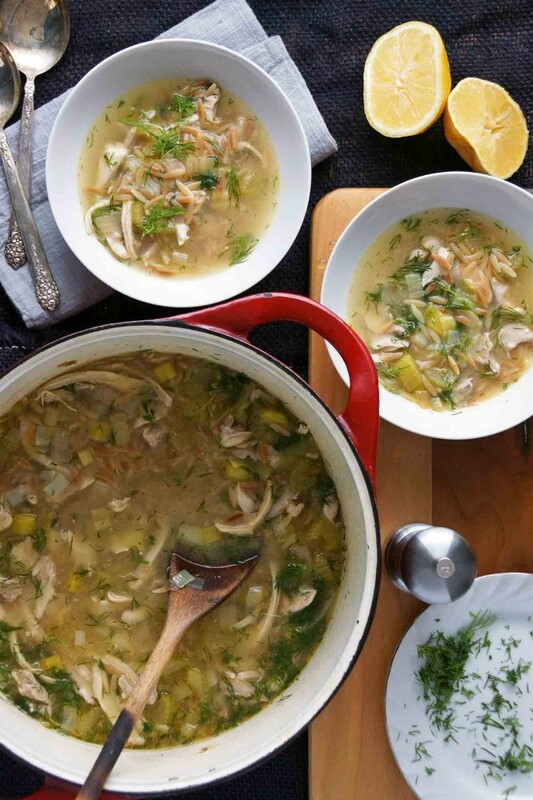 I hope you like the chicken soup–I’ve probably made it a half dozen times this winter and it always hits the spot!